Sometimes the creation of a product is a beautiful thing to watch. A Structural Insulated Panel, or SIP, is no exception. The backbone of our hurricane-resistant building system is the Integrated Frame and Panel, which consists of the Timber Frame and the SIPs. Because we build all of our SIPs to size in our shop, we have the ability to create SIPs of every size, shape, and thickness. What is a Structural Insulated Panel? A SIPs panel, on the other hand, contains no elements that aren't structural. Continuous plywood on both the inside and outside of the wall provides strength, and a continuous core of EPS (expanded polystyrene), also known as styrofoam, runs throughout the wall with no voids whatsoever, providing higher insulation value per square inch than fiberglass insulation. The result is a super- stiff building component, which (when built properly), can deliver a far stronger and superior building member. 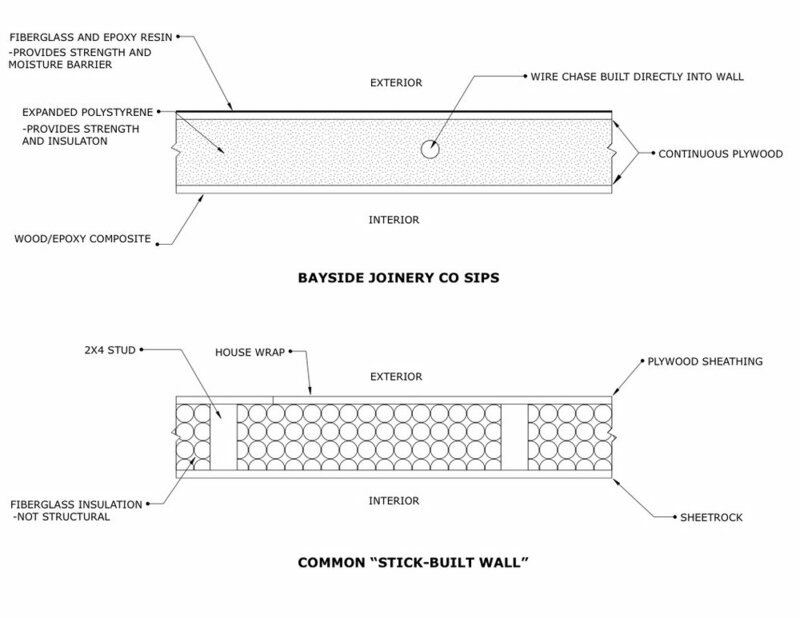 At Bayside Joinery Company, we take our Structural Insulated Panels to the next level by adding a layer of Fiberglass to the exterior. This not only provides even more strength to the panel, but also creates a 100% moisture barrier and a sleek, paintable surface. Additionally, our alternative to sheetrock is an epoxy-wood composite which is painted and looks like any other wall. The only difference is that when it gets wet, it won't crumble into wet dust as sheetrock commonly does. The time lapse below shows the lay-up of a wall panel during the vacuum-bagging process. "We've figured out a better way to build a wall, a better way to build a roof, a better way to build a house; one where every component provides strength and dead weight is a thing of the past." Our panels come with windows and door jambs installed. Forget cutting out your window and door openings. Our Structural Insulated Panels come equipped with window and door jambs pre-fabricated and cut out to make the builder's job easier. We have the ability to deliver panels with a finished interior and exterior. Our signature fiberglassed exterior and composite interior is a big leap forward in SIPs panel technology. We can deliver panels which are sealed, primed, and ready for final paint. The possibilities are endless when it comes to the stage of completion you want. 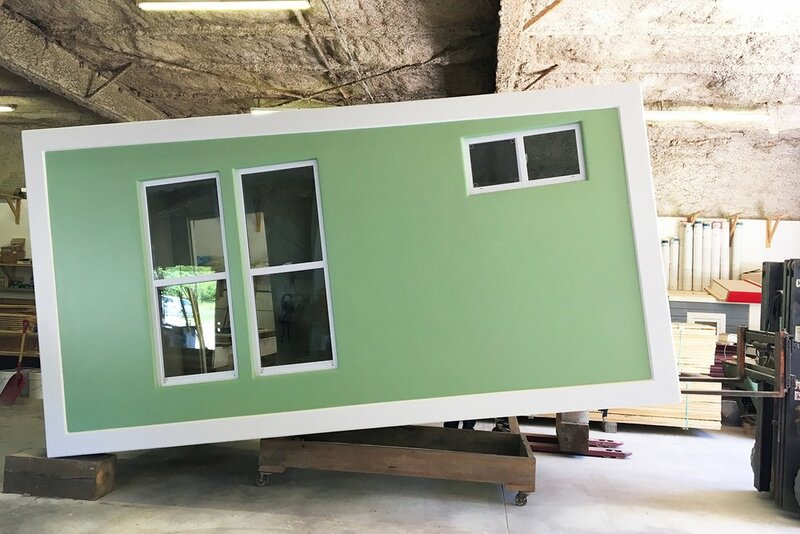 The sips walls of this "the bayside rambler" tiny house are so stiff and lightweight, the entire house can be lifted with a forklift, hinging on one end. Let us build your SIPs for your next project. Because we custom-build each and every SIPs panel in-house, we can build all shapes and sizes of panels, including curved SIPs. We have the ability to deliver pre-finished SIPs with a paintable, durable interior and exterior - no sheetrock required. Did I mentioned we are also home designers? If you would like to get in touch about a custom SIPs home or custom SIPs panels for your project, please use the form below or Contact Us.